There's no "one size fits all" wallet. Wallets come on different platforms with different features. Just enter your wallet preferences and we'll show you the best crypto wallet for your needs. What is your main use for the wallet going to be: secure storage or daily spending? The first step in finding out which wallet is best for you is to determine what you'll be using the wallet for. Wallets are built for different purposes. Some are made for secure storage, while some are geared towards people who make daily transactions. Is storing many different types of cryptocurrencies (like litecoin, ether, or ERC20 tokens) important to you? Since this page is for Bitcoin wallets, we assume you're looking for a Bitcoin wallet. If you'd prefer a wallet that stores bitcoins and also other coins and tokens, then be sure to select the first option. Which operating system do you plan to use? iOS, Android or desktop? Wallet apps are built to run on different operating systems. Some wallets only work on desktop, but not on mobile. There are plenty of options for each operating system. The Ledger Nano S is the cheapest hardware wallet. Hardware wallets secure your coins by storing them offline and away from hackers. The Ledger Nano S supports more coins than any other hardware wallet, like bitcoin, litecoin, ether and more. It can be used with any desktop computer or Android device. The Ledger Nano X is Ledger's newest hardware wallet. The main benefit is that it has bluetooth, making it the first hardware wallet that connects with iOS devices. Unfortunately it's not available until March 2019. It's more secure than using just an app on your phone, because all transactions are signed with the Nano X.
TREZOR launched in August 2014 as the first Bitcoin hardware wallet, offering secure bitcoin storage plus the ability to spend with the convenience of a hot wallet. TREZOR is a small, thumb-sized device. Samourai is 100% the best available Android wallet. It has the most features, the best privacy and its developers are constantly working to add the latest Bitcoin features to the wallet. Samourai Wallet has been around for more than 3 years and its code is fully open source. Coinomi is the most popular multi-coin cryptocurrency wallet for iOS and Android. It supports over 100+ coins including bitcoin, litecoin, ether, dash and more. DropBit is the most user-friendly iOS wallet available. You can send bitcoin to friends using just a phone number. Most importantly, DropBit allows you to control your own private keys. Electrum wallet is an easy to use desktop wallet for Mac, Windows and Linux. It's east and fast to setup so you can start sending and receiving bitcoins right away. Exodus is the most popular multi-coin cryptocurrency wallet. It supports Bitcoin, ether, litecoin, dash, Golem and many more. You selected selected "iOS" and "Secure". Hardware wallets are the only secure wallets, and they don't work with iOS (only desktop and Android). Please try again. Sorry, we did not find any wallets that match your criteria. Please try again. What is a Bitcoin & Cryptocurrency Wallet? A Bitcoin/cryptocurrency wallet is the first step to using Bitcoin or crypto. A “wallet” is basically the equivalent of a bank account. It allows you to receive bitcoins and other coins, store them, and then send them to others. Wallets contain private keys; secret codes that allow you to spend your coins. In reality, it’s not coins that need to be stored and secured, but the private keys that give you access to them. A crypto or Bitcoin wallet is simply an app, website, or device that manages private keys for you. This guide will show you how to create a wallet and pick the best one. Let's discuss the types of wallets and why you might want to use one kind over another. Hardware wallets are a good choice if you’re serious about security and convenient, reliable Bitcoin & crypto storage. Hardware wallets keep private keys separate from vulnerable, internet-connected devices. Your all-important private keys are maintained in a secure offline environment on the hardware wallet, fully protected even should the device be plugged into a malware-infected computer. As bitcoins and cryptocurrencies are digital, cyber-criminals could, potentially, target your computer’s “software wallet” and steal them by accessing your private key. Generating and storing private keys offline using a hardware wallet ensures that hackers have no way to reach your coins. Don’t worry about your hardware wallet getting stolen, lost or damaged either; so long as you create a secret backup code, you can always retrieve your coins. Think of a hardware wallet like your own underground steel vault. If you own a significant amount of bitcoin or crypto, you should strongly consider getting one! Why are hardware wallets good? Why are hardware wallets bad? Hot wallets are wallets that run on internet connected devices like a computer, mobile phone, or tablet. Private keys are secret codes. Because hot wallets generate your private keys on an internet connected device, these private keys can’t be considered 100% secure. Think of a hot wallet like your wallet today: you use it to store some cash, but not your life savings. Hot wallets are great if you make frequent payments, but not a good choice for the secure storage of bitcoins. Why are hot wallets good? Why are hot wallets bad? Which Wallet is Best for You? Why are you using Bitcoin & Crypto? Investing or saving? Then a hardware wallet will keep your coins safe. Otherwise, a software wallet will send and receive bitcoins & crypto just fine. Best of all, software wallets are free. Each wallet has pros and cons, and different wallets are built to solve different problems. Some wallets may be geared towards security, while some wallets may be more focused on privacy. Your specific needs should determine the wallet you use, as there is no “best bitcoin wallet”. Below, we've listed wallets you can buy or download. We suggest using the wallets listed or doing research before buying or downloading any wallet. Each day, new Bitcoin scam wallets are added to the Google Play Store and Apple app store that are designed to steal peoples' bitcoins. We only list wallets that have published and open-sourced their code. The three most popular hardware wallets: KeepKey, Ledger Nano S, and Trezor. But the price can be worth it if you own a significant amount of coins. A hardware wallet will protect a few hundred in bitcoin/crypto just as effectively as a few million. Hardware wallets are secure, offline devices. They store your private keys offline so they can't be hacked. This means you can even use one on a malware infected computer. In the table below, you'll notice we show which hardware wallets have screens. Screens provide extra security by verifying and displaying important wallet details. Since the hardware wallet is nearly impossible to hack, its screen is more trustworthy than data displayed on your computer. We also did a detailed comparison of the three main ones: Ledger Nano S, Trezor, and KeepKey. The Ledger Nano X is Ledger's newest hardware wallet. The main benefit is that it has bluetooth, making it the first hardware wallet that connects with iOS devices. It's more secure than using just an app on your phone, because all transactions are signed with the Nano X. The Ledger Nano S is the cheapest of the three hardware wallets with a screen; it costs about $59. Ledger, one of the most well-known Bitcoin security companies, released the device in August 2016. The TREZOR Model-T is a second generation Bitcoin/crypto hardware wallet manufactured by SatoshiLabs. The TREZOR line debuted in 2014 with the TREZOR One and has remained one of the most popular cryptocurrency cold storage solutions to date. KeepKey was released in September 2015 and was the second hardware Bitcoin wallet to offer a screen. The KeepKey's larger screen gives it some extra security features that the Nano S and Trezor lack. Hot wallets are Bitcoin wallets that run on internet connected devices like a computer, mobile phone, or tablet. As hot wallets generate private keys on an internet connected device, these private keys can’t be considered 100% secure. Web wallets store your private keys online, where they are encrypted with a user-selected password. Although they offer the lowest level of security, online bitcoin wallets have the advantage of being accessible from any internet connected device. GreenAddress is a multi-signature Bitcoin wallet available on the web, desktop, Android, and iOS. GreenAddress is compatible with hardware wallets like TREZOR, Ledger Nano, and the HW.1. “Multi-signature” in this context means that the site requires a manual confirmation from you for your coins to be moved; this greatly improves security. There is a large selection of Android wallets. Since Bitcoin wallets were originally banned by Apple, developers spent much of their time developing for Android. Mycelium is the most popular Bitcoin wallet on Android. It's very easy to use for sending and receiving payments. Backing up your wallet is also simple, since Mycelium makes it very clear with setup and backup instructions. breadwallet, the great iPhone Bitcoin wallet, recently released an Android wallet. It offers the user control of private keys, an easy to use interface, and passcode support. Edge is an easy to use Bitcoin wallet for iPhone and Android. Its familiar login feature makes using the app a breeze for people new to bitcoin. The wallet also creates automatic backups, so you don't have to worry about the technicalities of performing manual wallet backups. GreenBits is the native Android version of GreenAddress. It’s a multi-signature wallet that also supports hardware wallets like TREZOR and Ledger. Bitcoin Wallet, or “Schildbach Wallet”, was the first mobile Bitcoin wallet. Bitcoin Wallet is more secure than most mobile Bitcoin wallets, because it connects directly to the Bitcoin network. Bitcoin Wallet has a simple interface and just the right amount of features, making it a great wallet and a great educational tool for Bitcoin beginners. Apple banned Bitcoin wallets from the App Store in February 2014, but reversed its decision a few months later. Luckily, there are now plenty of options for iOS users. We consider breadwallet, along with Copay (below), as the best bitcoin wallet for iPhone. It’s open source and gives the user full control over their private keys. 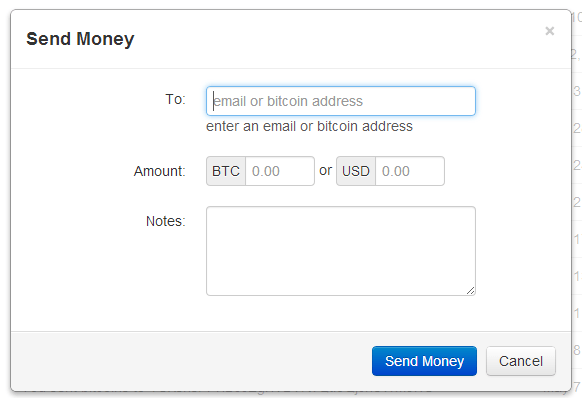 It also has a clean interface which makes the sending and receiving of bitcoins a pleasurable and super-simple process. Desktop wallets are downloaded and installed on your computer. If privacy is your main concern, the Bitcoin core wallet is a good option since it does not rely on third parties for data. 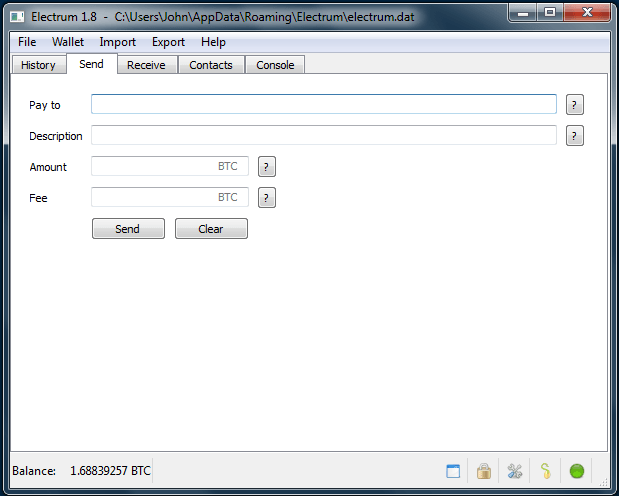 Electrum is a light weight Bitcoin wallet for Mac, Linux, and Windows. Electrum was created in November 2011. The main features of Electrum are: support for hardware wallets (such as TREZOR, Ledger Nano and KeepKey), and secure Bitcoin storage using an offline computer. Electrum is a good option for both beginners and advanced users. One last thing to keep in mind when it comes to bitcoin wallets is that there is a difference between a wallet and a bank. Some Bitcoin users view Coinbase as a Bitcoin wallet, but companies like this operate much more like banks. The private keys are what users need to protect to safely use the Bitcoin network without getting robbed. When you hand someone else control over your private keys, you are essentially making a deposit at that financial institution – much like a deposit at any bank. Don't store coins on exchanges! Bitcoin users have lost over $1 billion worth of bitcoins in exchange hacks and scams. Control your own private keys. This is not to say that bitcoin banks are inherently bad. Companies like Coinbase have done wonders for bringing more users into the ecosystem. It is simply important to remember that whoever controls the private keys controls the bitcoin attached to those keys. A misunderstanding of this point has led to hundreds of millions of US dollars being lost in the past, so it’s important to understand this critical difference in how Bitcoin private keys can be stored. Understanding how bitcoin wallets work is an important aspect of safely using this new technology. Bitcoin is still in its early years of development and wallets will become much more user-friendly in time. In the near future, certain devices may eventually come with pre-installed wallets that interact with the blockchain without the user’s knowledge. For now, it’s vital to keep in mind that the private keys are what you need to protect if you want to keep your bitcoin safe from hackers, user error, and other possible issues. Your bitcoins are only safe if the private key was generated securely, remains a secret, and--most importantly--is controlled only by YOU! Generate your private keys in a secure, offline environment. (Except if using trivial amounts, in which cases keys may be created in a hot wallet). Create backups of your private keys. This helps to protect against the loss of your bitcoins due to hard drive failure or some other problem or accident. Ideally you should have a duplicate set of backups kept off-site to protect against the possibility of fire, robbery, etc. Encrypt wallets to provide additional security. This helps prevent the physical theft of your funds in the event that your device or hardware wallet is stolen. With Bitcoin you have the privilege - but also the responsibility - to safeguard your own money. There have been countless scams related to Bitcoin that could have been prevented had people not entrusted others with their bitcoins. Bitcoin Wallets let us send, receive and store Bitcoin amounts all the way down to the Satoshi unit. Wallets secure funds by guarding our private keys. These private keys act as the proof of ownership for our Bitcoins. As such, a Bitcoin wallet is like a key to your safe deposit box on the Blockchain. How do I generate a Bitcoin address for my wallet? How to generate a new Bitcoin Address varies between wallets. Some manage your addresses for you. Others give you full control. As with many other Bitcoin technologies, the option to dirty your own hands is always open. If you do end up taking the easier route, just press a button to generate a new address for your wallet. Some wallets, like Electrum, allow you choose in how many blocks your transaction should be confirmed. The faster you want your payment to go through, the more you will have to pay miners for confirming your activity. We find here another difference between Bitcoin wallets and Bank accounts. Given the right wallet, the control and oversight that we have over our transactions is far more extensive than that of the traditional banking system. How do I fund a Bitcoin Wallet? First, acquire some Bitcoins. Go through an exchange in your country, ask an acquaintance to share, or use Buybitcoinworldwide.com if you want as seamless of an experience as possible. The purchased coins can then be sent to your wallet by specifying one of its addresses. Some wallets, particularly online ones, also let you buy coins. Keep in mind that these come with larger exchange margins which are best left alone. Is Bitcoin a safe way to store value digitally? Are we wise to save our coins on our computer? It’s true that online wallets are necessarily more dangerous than offline wallets. However, even offline wallets can be breached, meaning that security in the Bitcoin world depends largely on following good practices. Just like you would avoid flailing your bills about in a dangerous place, you should make sure to keep your passwords and keys as safe as possible. To some readers this might seem like a weird question. Truth is, people coming from a financial or business background are likely to expect Bitcoin to be a direct alternative to our current financial system. This is not the case. You don’t need a Bitcoin account. There is no such thing really. You just need a wallet. The only accounts you might encounter are online wallets that are separated into various accounts via a user system. How do I know which wallet is best for me? Let’s be honest. It’s unreasonable to expect anyone else to make this decision for you. After all, your preference depends entirely on your personality and needs. So just be honest with yourself. Frankly, you shouldn’t need anything complicated if you’re using the wallet for simple internet expenses or as a way to save money. If, however, you’re planning to run a Bitcoin centered business make sure to use advanced wallets that support automated mass payments. Any common mistakes to be careful of? First of all, don’t rest your money in an exchange wallet. Keep your coins in an environment where you have complete control. Secondly, don’t keep all of your coins in one place. You’ll be crushed if you lose access to a wallet with all of your funds. Thirdly, double check the target address. Bitcoin transactions cannot be reversed, so don’t lose your coins forever to a stranger! Last of all, use trusted online wallets (if at all). Don’t just trust anyone with your money. Make sure that the online wallet provider has a reputation of upholding the highest possible security standards. What other kinds of wallets can I use? Other wallet types are hot wallets. This means they are wallets run on an internet connected computer. Android wallets, iOS wallets and desktop wallets are all examples of this. How many backups of my seed should I create? We recommend keeping at least two backups of your seed in multiple locations. You can also laminate your seed to protect against water damage or any other damage. Keeping your seeds in fire proof safes can help protect in the event that the storage location is burned down. Another option is to put your seed into metal manually using stamps, or using Billfodl. What happens if someone finds my 24 word seed? Unless you’re using a 25th word, someone who finds your 24 word seed can sweep your entire wallet. Once you get the hang of things, it is better to move your coins off of Coinbase and into a wallet mentioned above like the Ledger Nano S . Coinbase is a good place to buy bitcoins and learn how it works, but not a good solution for long term storage. A full-featured Android app enables access to all account functions on the go. Coinbase’s founders have a proven startup track record and have raised money from very prominent venture capitalists. This gives Coinbase a level of legitimacy unparalleled in the Bitcoin space. They are also one of the only large Bitcoin companies to never suffer a major hack. Click here to sign up. Electrum is a software wallet that enables you to set up a strong level of security very quickly. During the simple installation process, you are given a twelve word phrase that will allow you to recover all of your bitcoins in the event that your computer fails. Your wallet is also encrypted by default which helps protect your coins against hackers. Electrum is available for Windows, OSX, and Linux and is our recommended software wallet for beginners. Click here to download the right version for your operating system. We also recommend a few other wallets, but not for the beginning Bitcoin user. If you are up for more of a challenge, Armory is a good choice for those requiring the highest possible security, and the original Bitcoin-Qt client is also trusted and worth learning how to use. Now that you have a wallet set up, it’s time to learn how to get some bitcoins. DigitalBitbox seems to be the product of the paranoid fevered dreams of an all too brilliant mind. Most true aficionados of cryptocurrencies tend to err on the side of caution where security is concerned. By comparison, the makers of DigitalBitbox live there permanently. By no means is that a bad thing as Shift Devices may have created the most secure cold storage device for cryptocurrencies outside of a paper storage. Not only is the DigitalBitbox a very well-guarded device, but it also brings a host of other features that really help to extend its usage and set it apart from the competition. Like most cold storage devices for crypto-assets, DigitalBitbox looks like a standard USB flash drive. The one thing that sets it apart from hardware wallets is the micro SD card embedded horizontally in the middle. Not only does this feature set it apart visually, but also functionally. The chief selling point of this hardware wallet is that you no longer have to write down several passphrases to recover your assets in case of an emergency. Rather, when you first setup the DigitalBitbox all this information is automatically stored on the SD card. No doubt, this has the potential to save many investors headaches in the future. Granted, you must still ensure that the SD card is kept somewhere safe and you should only ever have into inserted in the DigitalBitbox on setup or when resetting. Beyond this great security feature, this new hardware wallet comes with a bevy of other features that either improve its overall security or extend its use beyond just storing your Bitcoins. Foremost amongst these features is the ability to create a secondary “hidden” wallet: marketed as “Plausible Deniability” by the manufacturer. The main idea here being that should store most of your assets in one less accessible wallet and the rest of them in the more visible one. If for some reason the more visible wallet is compromised, the hidden wallet and your main resources stay intact. With the aid of the micro SD card, you can regain access to them later. Additionally, the DigitalBitbox has two modes of twin factor authentication. First, when paired with another device, you can enable two-factor authentications for using the wallet to make new transactions. Alternatively, you can use the DigitalBitbox itself as the second factor for another platform that uses two-factor authentications. It should be noted that doing this does disable some other options on the wallet. Ideally, only the first mode of twin authentication should be used if your DigitalBitbox is your main hardware wallet. However, if you don’t intend to use it for making many transactions, then it makes for a useful extended feature. When it comes to using cryptocurrencies, if security dominates your every thought, then the DigitalBitbox is the hardware wallet that you are looking for. It is exceptionally easy to engage with and it utilizes open source applications for Linus, Mac, and Windows. The only real downside for prospective users is that for all intents it is currently restricted to Bitcoin. Otherwise, it novel new platform that offers solid functionality and comes at a very competitive price. Recently, there has been a lot of excitement around Bitcoin and other altcoins. It is understandable that some newcomers have the impression that Bitcoin is some sort of collectible item, yet the fact remains that Bitcoin is simply a currency. Stripped of all the hype and value predictions, Bitcoin is primarily a means of exchange. OpenDime is a relatively new cold storage platform that truly embraces the values of decentralization and relative anonymity. In an era where highly, accessible centralized hot exchanges are all the rage, OpenDime hearkens back to a purer philosophy and with it brings its own new take on hardware wallets to the marketplace. OpenDime is the making a name for itself as the “piggy bank” of cold storage units in the world of cryptocurrencies. It functions like other cold storage units with one key exception: one-time secure usage. That one key difference changes quite a lot in the way people use it. Other storage platforms act more like wallets to be used repeatedly with a reasonable degree of security. Whereas an OpenDime unit can be used extremely securely as an address to store Bitcoins until the owner needs to cash out, but only once. In a manner that directly parallels smashing open a piggy bank, once an OpenDime storage unit is “opened” it can no longer be used with the same degree of safety again. OpenDime is a platform that changes the intangible asset of Bitcoin into a physical thing that people can exchange between each other in the real world. OpenDime works in a similar fashion to most cold storage units. You buy it, you initialize it, then you use it. The one add-on to this process is that when you want to cash the funds stored on it, you literally have to break it open. The initialization process is relatively simple. Plug it into a USB port on your device. You will then have to generate a private key by adding 256 KB to the drive. You can do this by dragging one or two random pictures into it. After the private key is generated the drive will self-eject. It is now ready to use. To manage your assets and view your digital address you will have to open the index.htm file located on the drive. The user interface is very easy to use and even provides links to several blockchain browsers. Eventually, you will want to access the Bitcoins or Litecoins stored on it. If you have the first version of OpenDime, you will need to break off a plastic "tongue" in the middle of the flash stick. Later versions work much like resetting old routers. You will need to push a pin through a marked section of the drive. Both of these processes physically change the drive. After doing this the private key associated with that OpenDime will be downloaded onto your pc or mobile device. This is the most vulnerable point in using the OpenDime. Make sure that you are using a secured system when doing this. You can then use the private key to access your funds in the same way you would with any other platform. Hardware wallets are more secure than any other software wallet, like one that runs on your Android or iOS device, or desktop. However, hardware wallets have some unique security risks to be aware of. We always recommend to order directly from the hardware seller. This is because someone can buy a hardware wallet, tamper with it, and sell it used. They could program it to steal any bitcoins or add a back door. Most hardware wallets add some special kind of tape on the packaging to try to make any tampering more noticeable. This is another reason we recommend only ordering from the hardware wallet company, and not from a website like eBay. Bitcoin private keys are based on cryptography. Random number generators, also called RNGs, are used to create the private keys that secure bitcoins. If the random number generator is not random enough, that means someone else can recreate the private key of the hardware wallet easier. This attack has happened in the past with blockchain.info, a web wallet. Over 300 BTC were lost because blockchain.info did not use good RNG, so a hacker was able to generate the private keys again and steal coins. One way to help prevent this is to use the hardware wallet’s custom 25th word. TREZOR, for example, allows you to add a 25th word to the 24 word seed. This means that you can technically add your own RNG to the computer generated RNG to ensure your private key will be truly based on good RNG. What happens if the hardware wallet company goes out of business? All hardware wallets listed above work with other wallets. So, if the hardware wallet company goes out of business you will still be able to use your wallet with a different wallet like Electrum. Let’s say you use TREZOR with TREZOR’s myTREZOR wallet. TREZOR goes out of business and no longer supports myTREZOR wallet and it gets shut down. You could, in just a few minutes, download Electrum on your computer. Once installed, you’d setup your TREZOR and all of your transaction history and balance would get imported and be exactly the same. This is because Electrum will use the same 24-word seed you generated with TREZOR on setup. Which wallets can be used for each device? Do these hardware wallets work for Ethereum? Yes, all of these wallets work with Ethereum, Litecoin and many other coins. TREZOR and Ledger both have blog posts explaining their integrations with various Ethereum wallets. The hardware wallet tells me to write down the 24 word seed on paper. Should I take a picture of the seed with my phone as a backup? The seeds generated by hardware wallets are meant to be written down only. By taking a picture of your seed with an internet connected phone, you put your entire wallet on a device that is connected to the internet and easier for hackers to get into. Please do not do this! Why do the hardware wallets have buttons? The buttons are used to confirm transactions. In order to send a transaction, you must physically press or hold buttons on the devices. This is a security feature. If a hacker were to access the hardware wallet somehow, the hacker still would not be able to send a TX without physical access to the buttons. Read more about this in TREZOR’s security philosophy. Do hardware wallets work with Coinbase? One of the most frequent questions we get asked is how Coinbase works with hardware wallets. Coinbase does not work directly with hardware wallet. You should, however, send bitcoins from Coinbase directly to your hardware wallet once you buy. Never store bitcoins on Coinbase or any other exchange for long periods of time. Too many people in the past have lost money from hacks like Bitfinex and Mt. Gox. So, yes, use a hardware wallet in conjunction with Coinbase. Buy on Coinbase, then send to hardware wallet. Also, what we said above goes for ALL exchanges. Use Bitstamp? Cool! Once you buy bitcoins on Stamp, send the coins to your hardware wallet. The same goes for Kraken, Poloniex, or any other exchange or service that holds your coins! Note that to use a Bitcoin/cryptocurrency hardware wallet you need a software wallet to interact with the device. All of the hardware wallets have default software wallets made by the company. However, you can also install separate software wallet to use the hardware wallet with an altcoin. A basic example is that TREZOR’s own wallet supports Bitcoin, but you can also use Electrum to use your TREZOR with Bitcoin. One may want to do this because Electrum has some unique features that TREZOR’s wallet doesn’t have, like spending from specific outputs or “freezing” certain addresses so they can’t be spent from. Another important reason for installing other software wallets is to hold other non-supported tokens. For example, the default Nano Ledger S software wallet can hold Ethereum, but it cannot hold other ERC20 tokens. In order to hold ERC20 tokens on the Ledger Nano S, you have to install a 3rd-party software wallet, such as MyEtherWallet (MEW). After installing MEW, you will be able to store ERC20 tokens on your Ledger Nano S.
Several hundred ERC20 tokens exist, so downloading a software wallet can massively increase your hardware wallet's functionality. If you are serious about using and investing in various cryptocurrencies, then you will need to get a hold of a hardware wallet, possibly more than one. All financial instruments are inherently risky. Cryptocurrencies tend to be riskier than most in a variety of ways. While it is impossible to eliminate all risk when using them, hardware wallets go a long way to reducing most. However, not all hardware wallets are created equal. It is not enough to buy just anything, but rather you need to carefully select the right option for you. For years there was little choice for cold storage options, but now there is more than ever. In this article we will take a look at the best on the market at the moment and why you should invest in them. The Cool Wallet is a recent addition to the cold storage marketplace and offers its own interesting take on things. Its looks certainly hold up to the first part of the brand name, but considering its form factor, it's more of a crypto-credit card than a wallet. The Cool Wallet also handles quite well when compared to other cold storage devices. Further, it has a very unique approach to passphrases compared with the norms for other hardware wallets. This device generates random 20 random numbers, as opposed to words, and even gives you the option to have them sent to one of your devices. Still, it is highly advisable to simply write them down instead. Cool Wallets are also inherently two factor authenticated, as they must be paired with another blue tooth enabled device to function. For some, this may be a possible security concern, but not hugely so, especially given the highly randomized “pass-numbers” and authentication process. In terms of design, this is maybe the best option and also great as a backup hardware wallet to handle small amounts of cryptocurrencies. DigitalBitbox is one of the most secure packages that you could purchase. It sacrifices quite a bit in terms of its physical interfacing, but more than makes up for that with its multi-platform open source software and an immense range of features. One of the best things about the DigitalBitbox is its unique adaptation for passphrase security and backups. This is maybe the one device out there, that comes with a simple yet truly reliable “second-chance” in the worst-case scenario. Additionally, it comes with multiple layers of added security including a hidden wallet and two-factor authentications. It also helps that it is one of the most affordable options out there at the moment. The only real drawback for the DigitalBitbox is its lack of support for most altcoins. That being said, if you are only or primarily using Bitcoin, then this is the hardware wallet for you. Currently, the industry leader in hardware wallets is the Ledger Nano S platform and it’s not hard to see why. This hardware wallet supports a large number of different cryptocurrencies and has a robust array of security features. Ledger’s main competitor in the market space is the original Trezor hardware wallet. One of the key advantages of the Ledger over the Trezor is the freedom to create your own unique passphrases. Both the Ledger and the Trezor require 20 passphrases for recovery and reset purposes; however, the Trezor package sends the user a random list. The Ledger gives the user the freedom to create their own. Additionally, if aesthetics matter to you, the Ledger sports an arguably sleeker design than the Trezor. The Ledger Nano S is definitely a safe place to start with hardware wallets, especially if you are just switching from using a hot wallet. In many ways, it represents the “CoinBase.com” of hardware wallets. If you are uncertain of where to start, this is probably for you. Launched back when Bitcoin was just coming out of its infancy, the Trezor was the first ever commercially available Bitcoin hardware wallet. Although many competitors have stepped forward over the years, it still remains one of the best hardware wallets for cold storage of cryptocurrencies. In a sense the Trezor is less “high-tech” than many other platforms; however, this makes it far less vulnerable. Additionally, a very nice feature of the Trezor is its semi twin factor randomized pin code generator that is required to be used before each use. On its own, it is quite resistant to any form of malware, but with this feature, you are protected from keyloggers as well. Depending on your aims, lifestyle, and preferences you may prefer one or more of the hardware wallets listed. Regardless of which you choose, it is simply important that you choose at least one and use it. The security of your Bitcoins and other altcoins is in your hands. We can both agree that finding the right cryptocurrency wallet can be confusing. But, don't worry: we've gone through all of the wallets and listed the best choices. Today we're going to make it easy to decide which wallet is best for you. Read on! Hardware wallets are small devices that are plugged into your computer or phone. The hardware wallet generates your private keys securely in an offline environment. The innovation is that many wallets generate private keys on internet connected devices like computers or mobile phones. By generating your private keys on an offline device, your keys are out of the reach of hackers. Overall, hardware wallets are the safest type of wallet, with many security features built-in as well as support for many different types of cryptocurrencies. If you have significant crypto holdings that you want to store securely, you should strongly consider getting a hardware wallet. Software wallets encompass a variety of different wallets, but in general they are wallets that are downloaded or accessed digitally. These wallets include online/web wallets, desktop wallets, and mobile wallets. Each type of software wallet has varying levels of security and accessibility, however, generally hardware wallets tend to be the safer but pricier option. Due to the variety in software wallets, we will cover each type individually in more detail below. Before continuing, it is important to note the difference between hot and cold storage. Hot storage refers to any type of wallet that is connected to the internet, while cold storage is any type of wallet that does not have internet connection. Hot storage is very convenient and accessible, however, it is much less secure than cold storage. Any time a wallet is connected to the internet, it has the potential to be hacked. Cold storage remedies this problem at the expense of convenience. Some software wallets can be hot or cold storage. If you download a desktop wallet on an internet-connected computer, it is hot storage. If you download the same wallet onto a device then disconnect from the internet, it becomes cold storage. Hardware wallets are always cold storage, with the convenience of a hot wallet. Mobile cryptocurrency wallets are software wallets that are downloaded onto your mobile device in the form of an app. The app stores your cryptocurrency. These wallets are simple and easy to use, and work well for people who pay for transactions using cryptocurrency. Mobile wallets are safer than online wallets, but are still vulnerable to hacks. Coinomi is another multi-cryptocurrency wallet that is available for iOS and Android. Coinomi is also integrated with ShapeShift and Changelly, another cryptocurrency exchange website. Coinomi also offers One-Time Backup. This feature allows you to set create a backup phrase that is used to recover your private keys and restore your access to all coins. The wallet is integrated with ShapeShift, so you can actually exchange coins from within the wallet. Jaxx is also available for Android. Desktop wallets are software wallets that are downloaded and installed onto your computer. These wallets store your private keys on your hard drive. This makes them safer than web wallets. However, if your computer is connected to the internet, your wallet is still vulnerable to attacks. Using a desktop wallet allows for greater security than a web wallet, and a number of different features. If you plan to store large amounts of currency on a desktop wallet, you should certainly place it in cold storage. Exodus is another popular multi-cryptocurrency wallet or universal cryptocurrency wallet, meaning it supports many coins. Like other desktop wallets, your private keys are stored on your computer. Exodus is also integrated with ShapeShift, so you can swap your coins within your wallet. Exodus is not entirely open source, however, so it is not as trustworthy as a fully open source wallet. Atomic Wallet is a new multiple currency wallet that allows you to manage Bitcoin, Ethereum, XRP and over 300 coins and tokens easily. Jaxx, the iOS and Android wallet we mentioned above, is also available for desktop. Jaxx is not open source, but the code is viewable on their website. The desktop version supports the same currencies previously listed, and also has ShapeShift integrated. Jaxx stores your private keys on your computer. Online wallets, or web wallets, are wallets that are accessed through your web browser. These wallets store your private keys in the cloud. Exchange wallets such as Coinbase are a type of web wallet. Web wallets allow you to quickly access your coins from any internet connected device. However, because a company holds your private keys, you have no control over your wallet. These companies could take use your private keys to steal your currency, or their servers could be hacked. We highly advise against web wallets, as they are by far the least secure type of wallet. Do not store a large amount of currency in web wallets, and do not use them for long term storage. MyEtherWallet (MEW) is an open source wallet that was launched in 2015. This software wallet is one of the most popular options for users looking to store Ethereum and other ERC20 tokens. Notably, MyEtherWallet cannot store Bitcoin, Bitcoin Cash, or other related currencies. It is solely for Ethereum based coins. MyEtherWallet generates private keys locally, so they are not stored on MEW servers. This increases security and puts control of the wallet into your hands. The next section will go over some popular cryptocurrency wallets. Creating a MEW wallet is a relatively simple process. The first step is to visit the MyEtherWallet homepage. Be sure the website domain is exactly correct to avoid spoofing websites. You should also bookmark the website to prevent this problem in the future. On the home page, enter a password, then select the "Create New Wallet" button. MyEtherWallet will then generate a "KeyStore" file in UTC/JSON format. This is your password protected private key. Select the "Download KeyStore File (UTC/JSON)" button, then click "I understand. Continue." The KeyStore file will be downloaded, and you will be able to view your private key on the next screen. You should save the KeyStore file to an offline hard drive, or a flash drive that you do not use online. After clicking "Save your Address", you will be prompted to unlock your wallet to see your public wallet address. In the selection screen, choose "KeyStore / JSON File". Select the KeyStore file that you previously saved, then enter the password you used to create your wallet initially. The benefit of using a KeyStore file is that you don't have input your entire private key, just the password that encrypts the file. However, this process is not entirely safe, as you are giving your private key file to a website. A safer alternative is running MyEtherWallet offline. This is a bit more complicated, but may be worth it for the extra security. First, download. Click on "etherwallet-vX.X.X.X.zip" to download, then move the file to a flash drive. Plug the USB stick into a computer with no internet access and extract all the files from the drive to the computer. Within the MyEtherWallet folder, select index.html to open the wallet. This will open MyEtherWallet in your browser. You will be warned that you can't connect to the network, but that is normal. When using the wallet in this manner, you won't be able to view your Ether or other token balances, but they can still be viewed with Etherscan. Note: MyEtherWallet was recently the target of an elaborate hack. In order to set up an Exodus wallet, first visit the Exodus website. Select the "Download" button, then choose your operating system. Run the file that downloads and install the wallet. In order to fully set up your Exodus wallet, you have to deposit some cryptocurrency. Select the "Wallet" tab on the left side of the screen. Select the cryptocurrency you wish to deposit, then click "Receive". Your deposit address will be displayed and you can select the copy button. Open the exchange or wallet you are sending the cryptocurrency from and paste the deposit address. After sending the cryptocurrency, you should be able to see it arrive in the Exodus wallet. Once it arrives, select the "Backup" tab. Create a password and continue. Exodus will then reveal your 12 word recovery phrase that you can use to recover your cryptocurrencies. Write this phrase down and store it away safely. Next, create a backup link by entering your email address. You can follow this email link then enter your password to regain access to your Exodus wallet. With these fail-safes in place, your wallet is all set up. To set up a Jaxx wallet for desktop, first go to their website, then select the downloads tab. Select the desktop version. Once the wallet is downloaded and installed, the first screen you will see is the release notes. Select "continue" then agree to the terms of service. In the next screen, select "Create New Wallet", then continue. Then, select the custom option, as this allows you to set up security features and other preferences. You can then select which cryptocurrency wallet(s) you would like to create. You must select at least one, but you can add or remove more at any time later on. You will then be asked to select the a fiat currency. The value of your coins will be listed in this currency. Jaxx will then ask if you'd like to create a wallet back up now. Select yes, and it will generate a 12 word backup phrase. Like the other backups, be sure to write it down and store it in a safe place. You'll then be required to type your backup phrase into the Jaxx wallet to ensure you did not just skip through that step. Finally, you can set up a 4-digit security which will allow you to access your wallet regularly. This section will aim to answer some of the most common questions related to cryptocurrency wallets. The cryptocurrency wallet that is best for you will depend on what you’re using cryptocurrency for. If you just need a wallet for some small, infrequent payments then using one of the Android, iPhone or desktop wallets mentioned above would be fine. If you are investing in cryptocurrency and need secure storage for your funds, then a hardware wallet like Ledger or TREZOR will better fit your needs. Paper wallets are a cheap way to create secure storage for crypto. The main issue is it’s very confusing and hard to do right. This is why we don’t cover it in this post. If you want to use a paper wallet, please do your own digging on Google. You’ll have to first buy cryptocurrency on an exchange and then transfer the coins from the exchange to your wallet. This is the only way to fund your wallet. Some wallets allow you to buy bitcoins from within the wallet, but there is yet to be a wallet that allows you to buy a coin other than Bitcoin. Is Coinbase a good wallet? Coinbase is an exchange and should not be used as a wallet. Coinbase is definitely a trusted place to buy bitcoins, but once you do so move your Bitcoin, Litecoin or Ether off the site into one of the wallets discussed in this post. Is Robinhood a good wallet? Robinhood is not a Bitcoin wallet. You are not able to withdrawal your coins from their app. How do I get a cryptocurrency address? Your wallet will automatically generate addresses for you. Each crypto has slightly different formats for the addresses. How do I open a cryptocurrency account? There is no such thing as a cryptocurrency account. You can have a wallet, which stores your coins. You can create an account on a cryptocurrency exchange, but this is not a default cryptocurrency account in the same way that you have a bank account. The biggest mistake we see people make is to store money on exchanges. Then the exchange gets hacked or exit scams and people lose their money. DO NOT STORE YOUR MONEY ON AN EXCHANGE! This section will give you some tips on how to secure your cryptocurrency in many ways, whether your on an exchange or wallet. The migration of value into the digital realm brings with it new challenges in terms of best security practices. As with any unit of value, there is always someone, somewhere that seeks to extract this value for their own ends, whether it be through coercion, social manipulation or brute force. This guide is intended to provide a broad overview of the best practices for securing your crypto assets. While most of these steps are not mandatory, following them will greatly increase your financial security and peace of mind in the crypto world. Starting from the ground up, password complexity and re-use are two major pain points that many average users do not consider adequately. As you can see by this list, average password complexity still leaves a lot to be desired. The less complex your password is, the more susceptible to hack your account is. If you use the same passwords, or even slight variations of the same passwords across multiple accounts, your chances of compromise are greatly increased. So what can you do? Fortunately the fix for this is relatively easy. Use randomly generated 14 character+ passwords and never re-use the same password. If this seems daunting to you, consider leveraging a password manager such as LastPass or Dashlane that will assist in password generation and storage. 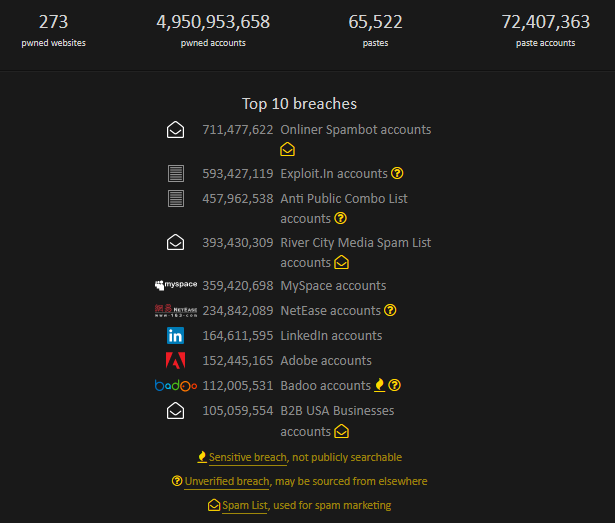 You can find out if any accounts associated with you have ever been compromised here as well as using this tool to test just how strong variations of your passwords may be (*do not use your real password on here, only similarly structured variations). Almost every online service/exchange requires some type of email account association during the activation process. If you are like most people, you will probably use your default email that you’ve had for years, and perhaps add a bit more complex password for the account itself for good measure. In most cases however, all a hacker needs is access to your emails in order to reset account passwords that may be tied to it. It’s as simple as navigating to the website/exchange and clicking the ‘forgot password’ link to begin the process. So, if you are like most people and have an email address that has been active for years, with a weak login password, your chances of being hacked are much higher. For the above reasons, do yourself a favor and create a new/dedicated email address for use with your crypto accounts. Services like ProtonMail and Tutanota are free and offer end to end encryption without sacrificing usability (mobile app availability etc.). If you decide to stick with Gmail, consider activating the Advanced Protection Program that Google offers. We typically recommend setting up two-factor authentication (2FA) for any and every account that offers it, even if the service is not crypto related. All 2FA does is require a second means of confirmation that you are who you say you are when logging into accounts. Most typically this is in the form of something you know (password) and something you own (SMS code sent to phone). FIDO U2F — This is a physical device that plugs into a USB port and requires a physical button touch to generate a unique 2FA access code. It is preferable because a hacker would need to have the device in their physical possession in order to access your account. Most hacks occur remotely which makes this our top 2FA choice (albeit not a panacea ). Google Authenticator — An app that resides on your mobile device and cycles through one-time use access tokens. If you go this route, be sure to save your backup code that is provided at initial setup. If you don’t have this and your phone is lost or broken then you have no way to get these code settings back. Authy — Similar to Google Authenticator but potentially less secure as you can re-access the codes from an alternate mobile device if your main one is lost or broken (this feature can be disabled but is active by default). While this may seem more ideal, what is more convenient for you is also more convenient for those who may be trying to hack you. SMS — Codes send to your cell phone through text message. Better than no 2FA at all, but susceptible to social engineering SIM attacks. Interestingly, SMS 2FA security holes did not come to light until the popularity of Bitcoin began to grow. If you don’t hold the private keys, you don’t own your money! This category is how most people have been compromised and lost money in crypto. How? Primarily, by treating an exchange (Coinbase, Binance, Bittrex, Poloniex etc.) as a wallet to store their crypto assets in. Mt. Gox, Bitfinex, BitGrail and Coincheck are just four out of a handful of crypto exchanges that have been hacked in the past 5 years, with the cumulative amount stolen exceeding $1 billion USD. While some users of these exchanges have been ameliorated to an extent, many are still suffering from the partial or even total loss of crypto funds that they held on these exchanges at the time of the hacks. Our advice is to hold crypto on hardware or paper wallets that you alone control. If you wish to trade on exchanges, only do so with funds that you are potentially willing to forfeit entirely should either the exchange or your individual account become compromised. A few of our recommended hardware wallet manufacturers are Ledger, Trezor, and Keepkey. You can find our more detailed wallet reviews here . As with all hardware/software, please ensure that your device firmware is kept up to date, as patches are pushed out continuously to address security concerns. Mobile app wallets such as Mycelium, Breadwallet, Samourai, Cryptonator, etc. should be treated similarly to how you may treat your physical wallet/purse. You only carry small amounts of discretionary spending funds in these wallets as they are more susceptible to loss or theft. Again, what is more convenient for you is more convenient for a malicious actor as well. Your phone is also susceptible to malware and should not be considered sufficiently safe for storing large amounts of funds. If you have crypto then you are an ideal target for phishing scams. Facebook and Twitter are just two of many avenues that hackers scour for potential victims. It has become common to see fake crypto exchange emails or ICO fundraising confirmations circulating such as the example below. 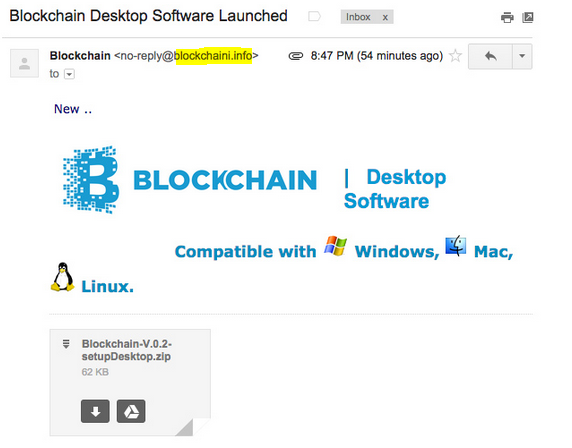 Phishing email impersonating Blockchain.info. Note send address & logo irregularity. It is best to NEVER open suspicious attachments or provide credentials through email and to always closely inspect the logo, wording and send address of any emails received that pertain to financial accounts or that request sensitive information. When in doubt, navigate to the legitimate exchange or web service that the email supposedly originated from and contact their support team to inquire on the validity of what you received before taking further action. This brings us to the general best practices portion of this guide. Malware is everywhere on the internet and regardless of your attention to detail, sooner or later you are likely to fall victim to some type of malicious software. As such, it is best to have active antivirus subscriptions on your devices and to run periodic scans. I personally like to run Malwarebytes and Roguekiller on my PC once each week and have background scans on my phone that run each automatically. Generally speaking Windows is the least secure OS, primarily due to the fact that it is the oldest and most pervasive OS in use today. Many security conscious techies tend to prefer Linux or iOS for this reason. Security on the web is akin to game of whack-a-mole and your level of security will likely scale accordingly with the amount of sensitive data (or crypto assets) that you are protecting. While there is no such thing as an ‘unhackable’ system, there are valuable steps that you can take to drastically reduce your likelihood of compromise.